Constitution By-Laws, Rules of Order, and List of Members, Mt. 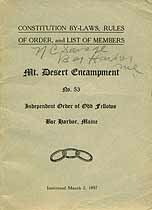 Desert Encampment, No. 53. Independent Order of Odd Fellows, Bar Harbor, Maine. Names in this online transcription include Allen, Arey, Austin, Bennett, Benson, Billings, Bird, Bradley, Brewer, Brown, Bryant, Bucklin, Bunker, Burns, Byard, Campbell, Candage, Carpenter, Carter, Clark, Cleaves, Clement, Collins, Connors, Copp, Cousins, Davis, Dickson, Dolliver, Donnell, Dorr, Douglas, Dow, Driscoll, Dunton, Dyer, Emdur, Emery, Fernald, Fifield, Fogg, Foster, Franklin, Freedman, Frost, Gabrielson, George, Gooch, Goodall, Gould, Grant, Graves, Gray, Green, Grindle, Grover, Guthrie, Haas, Hadley, Hagerthy, Hamilton, Hamor, Haraden, Hardison, Hardy, Haskell, Haynes, Hayward, Higgins, Hillson, Hodgkins, Holland, Holmes, Hooper, Howard, Jellison, Johnson, Johnston, Jordan, Joy, Keller, Kirk, Kramer, Kurson, Lawford, Lear, Leighton, Leland, Leonard, Liscomb, Lord, Lymburner, Lynam, Marcyes, Marshall, McCrae, McFarland, McGouldrick, McIntire, McIntyre, McKay, McLean, McQuinn, McVicar, Moon, Morrison, Morse, Mosley, Murphy, Nickerson, Norwood, Ober, Ochs, Orchard, Paine, Parker, Patten, Peckham, Perlinsky, Perry, Phillips, Phippen, Pinkham, Preble, Quimby, Rafuse, Ralph, Reed, Reynolds, Richardson, Rider, Robbins, Roberts, Ronald, Rosebrook, Rowell, Ryder, Salisbury, Sargent, Sawyer, Seavey, Sherman, Shiro, Simpson, Small, Smallidge, Smith, Snow, Sprague, Spratt, Spurling, Stanley, Stearns, Stewart, Strout, Suminsby, Swanson, Tabbut, Thomas, Thompson, Tower, Tracey, Tracy, Turner, Wadleigh, Wakefield, Walls, Ward, Wasgatt, Watson, Webber, Wescott, Weston, Whalen, White, Whitmore, Whitney, Wilbur, Wilcomb, Williams, Winslow, Woodworth, Young. The Genealogy Today catalog number for this item is 13363. When inquiring about the information in this resource, please mention the catalog number.